Those who receive a decision on their need for outpatient treatment or permission to be discharged from a hospital by a court must then receive outpatient medical care at a designated outpatient care hospital (designated by the Minister of Health, Labour and Welfare) for three years, in principle, and are placed under mental health supervision by probation offices during that period. Under mental health supervision, rehabilitation coordinators provide the subject persons with the necessary instruction and advice to make them take a constant medical care, which mental health supervision aims at, by supervising their hospital visits and living conditions through interviewing them and receiving reports from the relevant agencies. In implementing mental health supervision, probation offices cooperate with designated outpatient care hospitals and prefectural/municipal mental health and welfare institutions in formulating individual treatment implementation plans for the subject persons. The treatment implementation plans include the content of and how to receive the necessary medical care, mental health supervision, and assistance, etc. in their local communities. More concretely, in addition to the goals of treatment within their local communities and the desires of the subject persons, the treatment implementation plans also include: outpatient medical care, care visits, and day care schedules; how to contact the subject persons, etc. with respect to their mental health supervision; and the content of and how to receive the available mental health and welfare services, etc. as assistance. Based on the treatment implementation plans, the respective relevant agencies maintain mutual cooperation each other in implementing the treatment. In addition, and according to the progress of the treatment, probation offices hold “care meetings” consisting of staff members of the relevant agencies to share information on the implementation status of the treatment, etc. and to standardize the treatment policies. The treatment implementation plans are reviewed when necessary. Fig. 4-5-3-5 shows the disposition of cases involving mental health supervision. 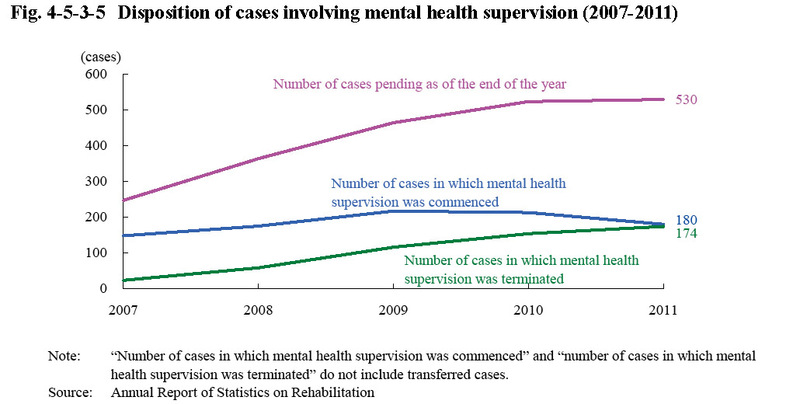 The number of cases in which mental health supervision was commenced in 2011 (excluding cases received by transfers) was 180 (140 of which were due to a decision on permission to be discharged), cases in which mental health supervision terminated 174 (99 of which were due to completion of the term of their outpatient treatment), and that pending as of the end of the same year 530. Courts also make a decision through hearings on the termination of medical care of those receiving outpatient treatment (excluding, however, termination by completion of the term of outpatient treatment) and the rehospitalization in designated inpatient care hospitals. In 2011, 52 decisions on termination of medical care and 14 decisions on rehospitalization of subject persons were made (Source: Annual Report of Judicial Statistics).